The other two individuals couldn’t believe their ears. All three had set out to accomplish this goal. They had made a pact that none would quit until they reached their destination. The two remaining were extremely disappointed, but undaunted by their companion’s failure. Onward up the hill the two climbed, full of ambition, knowing that success was within their grasp. About halfway up the second individual paused, took off the backpack, sat down, looked up at the final individual and said, “Y’know, I’m tired. Besides, who’s to say that what I’m looking for will be at the top of the hill. I’ve come this far, and I feel pretty good about what I did. Look at all of those people at the bottom of the hill who couldn’t get this far. They’re the lazy ones! I think instead of climbing up the hill, I’ll just walk around it. That’s easier on my body, and I’ll still reach my goal. It’ll just take a little longer, that’s all! The final individual’s head shook in disbelief! The above story is dramatized for effect, but the end result can apply to many situations in life. 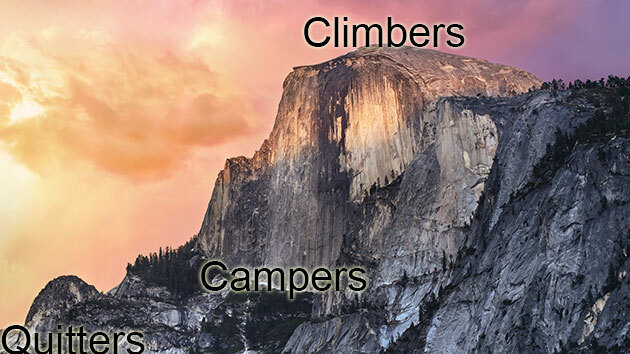 Are you a quitter, camper, or climber. Before you answer, let’s define each and list the predominant characteristics. See which category you fall into! Quitters are people who…well…quit! They quit on themselves and others. Quitters cop out, back out, drop out, run out, and get kicked out. They get upset if things aren’t going according to plan, yet are quick to blame others for their own lack of progress. Quitters abandon their cause or goal easily, usually seeking the “shortcut” in exchange. Quitters are quick to try and drag others back down to their level of discontentment. They want everyone to feel as bad as they feel and will take any means necessary to “rain on your parade.” Quitters can be great gossips and backbiters. I call quitters “The boo-bugs” – you know – the people who talk about you behind your back about why and when you’ll fail, but in reality are jealous because they don’t have the drive, discipline, determination, desire, and heart to accomplish what others have worked hard for. They are externally motivated, meaning instead of achieving their own definition of success, they want to try and accomplish what others have done. Quitters move from plan to plan and location to location seeking the magic answer. Unfortunately, quitters never quite realize that they can achieve success. The irony is that quitters usually suffer more pain, hardship, and discontentment further down the road. Quitters just have to quit complaining and just start doing! If they would put as much energy into achieving success as they do into complaining, making excuses, and changing courses, success would be virtually guaranteed. Campers are people who start out ambitious, but somewhere down the road they get stuck in a rut. Campers do the same thing day in and day out. Comfort becomes their primary goal. Campers become satisfied with mediocrity – their favorite slogan is “That’s good enough!” For campers, anything that doesn’t challenge them beyond their present potential is acceptable. Campers usually choose the easier, more traveled road. They don’t want to be pushed or challenged to grow, because growth (both mental and physical) can be hurtful and painful. Campers float between internal and external motivation depending upon the challenge. Once campers become accustomed to a current way of living it’s difficult for them to change because of fear. The fear of success, fear of failure, or fear that their lives will become disrupted or compromised beyond their control dominate their thoughts. Campers can have great unrealized, untapped potential. They just have to believe in themselves, let go of their fears and inhibitions, and not let anyone or anything deter them from their goal. Climbers live without compromise. They make no excuses for their lack of progress other than “I could have/should have worked harder.” Climbers accept responsibility for their actions and seldom place blame on others. They may camp for a while, but only to gather strength for the next challenge. Climbers accept challenges readily – they welcome adversity and continually strive for self-improvement. Climbers understand that in the pursuit of a goal, it’s not really the destination or end result, but rather the process or journey that’s the challenge. Climbers continually challenge themselves by making “games” out of reaching goals. Reaching or mastering one goal just allows a climber to start a new game. Climbers are internally motivated, usually with a Type A personality – a real go-getter! A climbers philosophy is simply “I can, I will, I shall!” Climbers make a way when there appears to be no way! When care is pressing you down a bit – rest if you must, but don’t you quit! And many a person turns about when they might have won had they stuck it out. Don’t give up though the pace seems slow – you may succeed with another blow. and he learned too late when the night came down, how close he was to the golden crown.